Tic Tac Trance #027 Replay available! 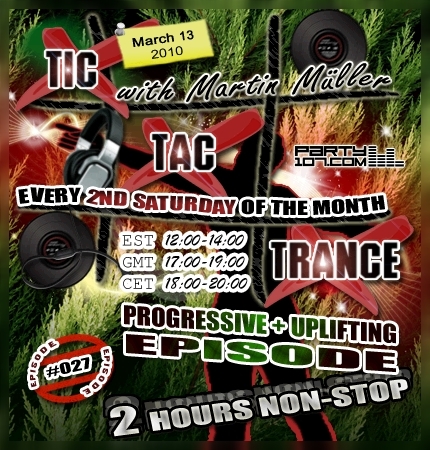 It’s almost time again for another episode of Tic Tac Trance! Episode #027 will be broadcasted on March 13 2010 on Party107.com and will feature an 2 hour mix by myself. This two hour melodic journey will start at proggy 128 beats per minute and ends with peak time uplifters! For this musical madness you can expect some new tunes from labels like Enhanced, Finity, Black Hole, Discover, Solaris and many, many more!